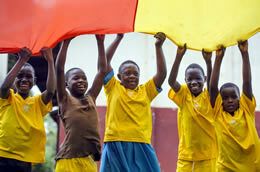 AbleChildAfrica is the leading UK charity working exclusively with and for children with disabilities in Africa. We work alongside partner organisations to achieve equal rights for children with disabilities and young people. In order to achieve this, we work in collaboration with five African-led partner organisations, in four countries, (listed below) to carry out life-changing work with the children and their families. We influence policy, legislation and international law that impacts upon children with disabilities in Africa and we share our expertise and experience through training and consultancy services. A shocking 98% of children with disabilities in Africa do not attend school. AbleChildAfrica really works hard to break down taboo, stigma and the barriers to education that these children unfortunately have to face. Money raised goes towards providing disability aids, undertaking school modifications, training teachers on inclusive teaching styles and advocacy work with local and national governments. Our work has been highly effective and the children with disabilities supported typically achieve the same rates of attendance as their peers without disabilities, despite the challenges they have had to overcome. All of this wouldn’t be possible without the generous support of you taking on the tremendous challenge of running the London Marathon for us. By running the London Marathon, you will be helping support some of the world’s most vulnerable children. £200 that you raise you could help equip over 100 children with disabilities with sports kit. We will provide you with one-to-one fundraising support from the very beginning of your application to the finishing line! We will also provide you with a fundraising pack and our best advice on how to reach and maximise your fundraising target. So please join our marathon team and support us in making sure children with disabilities are included as equal members of society and provide them with the same opportunities so they can fulfil their own ambitions.